This is a big bundle of Easter activities. There are a total of 7 different sets in this bundle including the Easter theme cards, the Easter I spy game, the Easter egg short vowel game, The Easter Egg crack number matching game, Easter Phonics Board Game, Easter theme more than, less than Math Game and the Easter egg crack alphabet matching game. 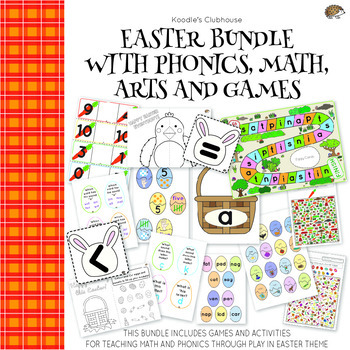 This is a great product if you are looking for a Pre-K to Grade 1 Easter theme bundle for Literacy and Numeracy centres. 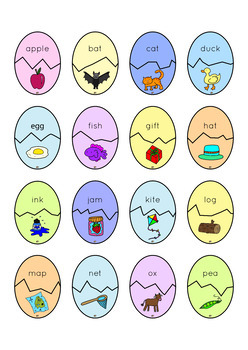 The Easter egg short vowels matching phonics game is a great way to help children practice spelling and sound recognition. You can hide the egg cards around the classroom or playground and have the children go on a short vowel Easter egg hunt. 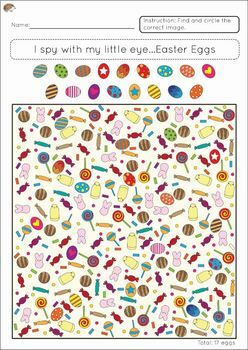 The Easter-themed I spy activity is a fun way for children to learn counting as well as practice recognition skills. It’s also good as a quiet activity for children who finish their work early. 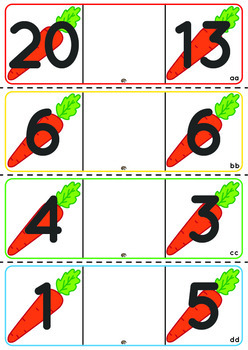 The Easter egg crack number matching game is great way to help children learn number comprehension. This egg matching game help children recognize Numbers 1 to 10 with counting objects, finger counting, dots, dice, tally marks and number words cards in color. Tried and tested in the classroom with great success, suitable for use with independent learning and math centers. A great way to welcome Easter is to make Easter greeting cards. Tired of just the standard colouring sheet? Why not try some interactive and pop up greeting cards? This set of greetings cards is easy to create and in a fantastic way to keep little ones busy after they have finished their classwork. The Egg crack alphabet matching game is a great hands-on activity to help children learn and recognize uppercase and lowercase letters. This set also comes with picture and word eggs as well. This game has been tried and tested in a classroom with great success.